Toxic chemicals don’t belong in feminine care products. Period. If you're a women, it pretty likely that you have used a tampon or pad (in fact the average woman who uses tampons or pads ends up using around 10,000 in her lifetime). However have you ever stopped to think about the what the tampon or pad is made of? or the chemicals that go into it? After all a woman ends up putting a tampon into the most sensitive part of her body (and a pad is right next to the most sensitive area). Campaign for Safe Cosmetics cites potential risks of feminine care products to include exposure to dioxins, pesticides, bleach and chemical fragrances. Tampons in Ellebox are non toxic and organic. 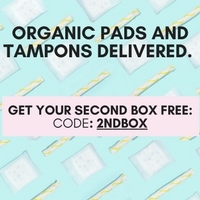 At Ellebox their tampons and pads are 100% organic cotton, and 100% good for you. I'll be honest, it took me years to realize just how astounding the impact of the conventional tampon and its plastic applicator. As a tampon applicator does not get recycled, it gets tossed into the trash and ends up immediately in the landfill. It only takes 100 women who use tampons to put 1 MILLION plastic tampon applicators into the landfill. While the beauty products from Nena Skincare were both a surprise and well over the value of the $29.99 (worth collectivley $60), I absolutely loved the Wellness Cleanse tea from Amoda tea. The final treat in the COMFORT box from Ellebox was the direct trade, farm to bar Truffle Pig chocolate bar. Because who doesn't need a reason to eat chocolate? There has been no significant research into the effects of harmful chemicals and repeated exposure in traditional tampons. Disclosure: This post which includes affiliate links. As always Florum Fashion Magazine is proud to share with you because, sponsored or not, we only share stuff we love & stand behind. We NEVER feature a product that doesn't fit into our own sustainable, ethical and environmental standards.